Wirt B. "Beecher" Twitchell, Jr., grew up in the rapidly expanding city of Phoenix, Arizona, and lettered in baseball and basketball at Phoenix Union High, at the time, the largest high school west of the Mississippi. Following graduation, he enrolled at the University of Southern California, where he pitched for the Trojans in 1936 and 1937. In 1938, the 6-foot-4, 220-pound right-hander signed with the Detroit Tigers' organization along with his brother Dan, who was two years younger than Beecher and a varsity catcher at the University of Arizona. Both players were assigned to the Beaumont Exporters of the Class Al Texas League. In mid-March Beecher pitched an exhibition game for the Exporters against Texas A&M College, and was then assigned to the Henderson Oilers of the Class C East Texas League, where he and Dan formed the battery in an exhibition game against the Shreveport Sports of the Texas League on March 29. When the regular season opened Beecher and Dan found themselves with the Hobbs Boosters of the Class D West Texas-New Mexico League. Dan only played five games for the Boosters while Beecher made 22 appearances for the last-place team for a 6-9 record and 6.65 ERA. The Twitchell brothers were out of Organized Baseball in 1939, but they both signed with the Brooklyn Dodgers' organization in 1940. 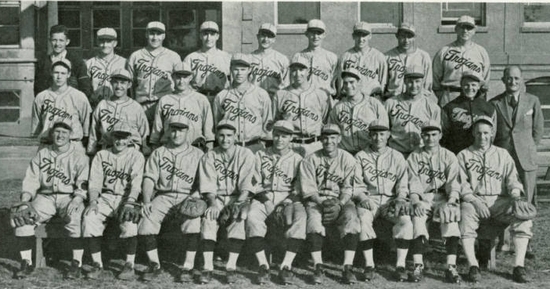 Assigned by the Dodgers to the Americus Pioneers of the Class D Georgia-Florida League, Dan worked behind the plate while Beecher switched to the outfield. After batting .224 over 45 games, Beecher was assigned to the Newport Dodgers of the Class D Northeast Arkansas League, where he again switched position, this time moving to first base, and batting .274. He finished the season with the Johnstown Johnnies of the Class D Penn State Association, where he batted .231 in 46 games and hit 12 home runs. On January 6, 1941, Beecher Twitchell entered military service with the Army. While his younger brother was catching for the Santa Barbara Saints of the California League, Beecher attained the rank of sergeant and was serving with the 27th "New York" Infantry Division, stationed at Fort Ord, near Monterey, California. In early February 1942, the 27th Infantry Division received orders for overseas duty, arriving in the Hawaiian Islands the following month and defending the outer islands from attack while preparing for combat. The division landed at Saipan in the Northern Mariana Islands on June 16, 1944, where it met fanatical resistance from the Japanese. Slowly the division moved inland to the mountainous terrain of central Saipan, where the Japanese had nowhere to retreat. On the night of July 7, 1944, an overwhelming Japanese force charged U.S. troops in one the largest suicidal banzai charges of the war. With bloody hand-to-hand fighting in progress everywhere, forward positions were soon overrun by the sheer weight of the enemy numbers. Casualties quickly mounted and ammunition ran low. The onslaught lasted 15 hours, but despite a high number of American casualties, 4,300 Japanese were dead and the battle for Saipan was won. Newly promoted First Lieutenant Twitchell was among those killed during the attack. Two days later, Saipan was officially secured and Saipan became an important base for further operations in the Marianas, and then for the invasion of the Philippines in October 1944. Beecher Twitchell is remembered at the Court of Honor, American Memorial Park at Saipan, and is buried alongside his father in Phoenix at Greenwood Memorial Park Cemetery. Dan Twitchell, served as a mechanic with the Army Air Force during the war, and did not return to professional baseball. He named his first son after his brother. Thanks to Daniel W. Twitchell, Jr., for help with this biography. Thanks also to Astrid van Erp for help with information for this biography.